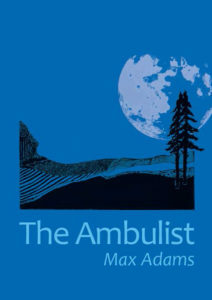 The Ambulist, Max Adams’s brilliant debut novel, brings his trademark poetic language, narrative power and thrilling evocation of landscape and journey into a near-contemporary literary thriller. The Ambulist is the man who walks forever. Through the plains and vales of Northumberland, across fell and river, mountain and moorland, the nomad’s titanic figure is pursued by people determined to discover his past. He might be an innocent traveller, a terrorist or the Second Coming of Christ; who can say? John Queedy is the painfully self- conscious, damaged young man who will become his protégé. M. is the time-worn proprietor of a failing regional newspaper who needs a story, a big story, to save his career. The Arnesens inhabit a Borders tower-house: indulgent, overflowing with love, music and art, they are witnesses to the First Miracle. Gaunt is a cynical hack, an exposer of fraud, and weak of virtue. Albie Rooi is the hunter.